Aspirin in low to moderate doses may lower the risk of death in women, particularly those who are older and prone to heart disease, a 24-year study of nearly 80,000 women suggests. However, experts cautioned that the results are not definitive and that women shouldn't take aspirin as a health preventive without talking to their doctor. In this long-running study of nurses who were middle-aged and older, women who took aspirin had a 25 percent lower risk of death compared to those who never took it. Aspirin-takers had a 38 percent lower risk of death from cardiovascular disease and a 12 percent lower risk of death from cancer. Many doctors advise people who've had heart attacks and strokes to take a daily 81-milligram baby aspirin, costing less than 50 cents a week. The new study suggests aspirin may help healthy women, too. No benefit was found for high doses, which the study defined as two or more standard 325-milligram aspirin tablets a day. "This confirms what we already know: Aspirin is good for you, whether you're a man, whether you're a woman," said Dr. Jeffrey Berger of Duke University Medical Center who studies aspirin's effects. He was not involved in the new research and receives no money from aspirin makers. However, since aspirin can cause ulcers and bleeding, Berger said, women should talk to their doctors before taking it to prevent disease. "It's not a little vitamin; it's not a sugar pill," he said. The size and length of the new study, appearing in Monday's Archives of Internal Medicine, make the results compelling. But the research, based on data from the long-running Nurses Health Study, was observational, meaning the women chose whether to take aspirin, rather than being randomly assigned to take it — a gold standard in research. The aspirin-takers could have been healthier than other women for reasons the researchers didn't take into account. The aspirin-takers also could have been more zealous about how they took other medicine, for example. On The Early Show, Dr. Stephen Scheidt, a cardiologist and professor at New York-Presbyterian Hospital/Weill Cornell Medical Center, agreed that the study applied "the silver standard" rather than the gold one. "But," he added, "it had 80,000 women in it. They followed them for 24 years. And … the results were really quite amazing. …This study started in 1980. In those days, doctors were not recommending that women take aspirin to prevent heart disease." 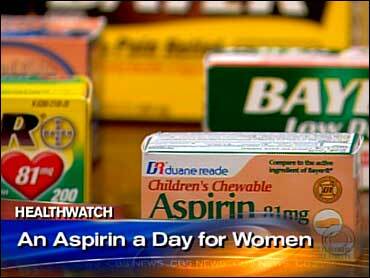 Asked if he recommends a daily low dose of aspirin for women, Scheidt responded, "I think so. There are problems with the study, and some doctors are going to be skeptical, but on balance, it makes sense." He suggests half a regular aspirin a day, about 160 milligrams, for men and women who don't have heart disease. Still, said study co-author Dr. JoAnn Manson at Harvard-affiliated Brigham and Women's Hospital, "We cannot prove a cause-and-effect relationship, and the results should be interpreted with caution. We don't want people hearing about the study and beginning to take aspirin long-term without having a discussion with their doctor." Most of the best-designed studies have not found that aspirin lowers the risk of death. But they have found that aspirin helps to prevent heart attacks in men and strokes in women. Aspirin is thought to prevent heart attacks and strokes by blocking platelets from forming blood clots. Its anti-inflammatory properties may also play a role in preventing cancer. The average age of the women was about 46 at the start of the study and about 70 by its end. The women at risk for heart attacks and strokes, and older women, got the most benefit. The researchers matched 9,477 women who died between 1980 and 2004 with women who didn't die. They looked at which women reported taking aspirin and took into account other risk factors such as high blood pressure, diabetes, smoking and weight. Cancer was the leading cause of death in the study. The researchers said they'd expect more deaths from heart attacks and strokes if the women in the study had been older. Cardiovascular disease is the leading cause of death in American women.